Glasgow is best explored with a hire car and VroomVroomVroom can help you find a vehicle that will best fit your budget. Just choose from the list of rental cars offered by the country's leading brands including Hertz, Avis, Alamo, Enterprise, Sixt, and Europcar. You can save time and money when you use our website in searching, comparing and booking a car hire in Glasgow. Also known as Glesga, Glasgow is Scotland's largest metropolis. It lies along the banks of the River Clyde on Scotland's west central part. The city is known for its arts, shopping destinations, culture, festivals, recreational facilities, music, Medieval remains and the Glasgow patter dialect. Driving around and or exploring Glasgow is easier with a rental car. Why rent a car in Glasgow at VroomVroomVroom? Great rates: We offer the best rates. Check out our price promise to find out how you can get a great deal. Wide selection of vehicles: All depots are strategically located within the city, close to many attractions. You can also book a car rental in Glasgow Airport. Apart from rental cars, you can also book a campervan hire in Glasgow through VroomVroomVroom. Trusted since 2001: Book with confidence because we are the experts in rental cars. We have been helping people book a rental car for more than 15 years. Make sure to contact us either via email, phone call, or live chat. 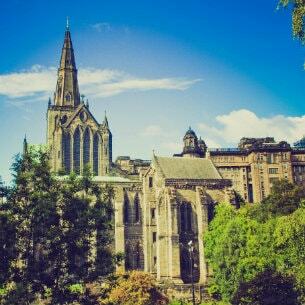 If you prefer a warmer weather, the best time to visit Glasgow is during spring and summer seasons. Enjoy 15 hours of daylight between March and August thus making it a popular time to throw numerous events including the West End Festival, Glasgow Jazz Festival, Glasgow Mela, and Surge Festival. If you are looking for a good deal on rental cars, hotels and airfare, travel between September and February, but be prepared for the cold weather. There are also some exciting events held during this time of the year such as Glasgow Doors Open Days Festival in September and The Mackintosh Festival in October. For foreign drivers, take note that people drive on the left just like in London but it is less crowded. If you are looking for a relaxing ride from Glasgow, take the Dumbarton route going to Balloch. The speed limit in Glasgow is 30mph but there are some roads that allow up to 40mph. However, main roads have a speed limit of 60mph and motorways with 70mph. Since some drives in Glasgow can be long, here are some tips on what to do when driving tired. Rush hour in the city is between 7:30 am until 9:30 am so avoid major roads during that period. Make sure you are aware of the road rules to avoid getting in trouble with the law. We at VroomVroomVroom aim to make your holiday in Glasgow more memorable that's why we have come up with a list of places you can visit and things to do during your stay. Start at the city centre where the finest theaters, museums, shopping streets and historical sites are located. Take a stroll at the Merchant City and the Princes Square. Watch performing arts at the area's several theaters and the latest movies at the world's tallest Cinema, The Cineworld along Renfrew Street. For more fun things to do, check out the list of attractions below. Do you want to add some twist to your typical favourite soccer game? Try playing bubble soccer with your friends and family. This revolutionary sport is fast becoming a trend in Scotland. It operates in various sporting venues in the country, including the city of Glasgow. If you want to play in your own venue, Bubble Soccer Scotland can bring the game to you! 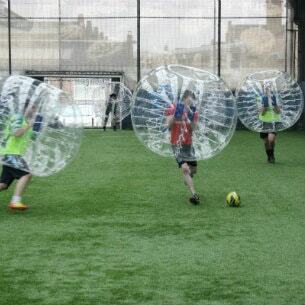 They use high-quality zorbs (transparent balls) so you will feel comfortable and safe whilst playing soccer. If you're looking for fun activities for your small children, then the best place to take them is at Whale of a Time Softplay Glasgow. Apart from their children's play area which features mazes and slides, they also have a special area for babies and toddlers which consists of a ball pool, and different toys. Instead of taking them to an outdoor playground, feel more at ease knowing that you child is safe here. Parents can even relax at the café while watching over their kids play. For the best bowling experience, visit Hollywood Bowl in Springfield Quay. The bowling complex is managed by the largest ten-pin bowling operator in the United Kingdom. You can expect state-of-the-art facilities and well-trained staff to assist you in everything you need. All of Hollywood Bowl's center have at least 24 bowling lanes, a cosy café, and a licensed bar. There are also arcade games for those who want to take a break from bowling. Glasgow's West End. It is well known for it's huge global tropical and temperate plant collections and it's magnificent glass houses particularly the Kibble Palace which has recently undergone a multi-million pound restoration. Also not to be missed is the arboretum, the world rose garden and the uncommon vegetable garden. Other facilities include a children's play area, visitor's centre, and ranger led tours. The city's oldest park lies along the northern bank of the Clyde River. 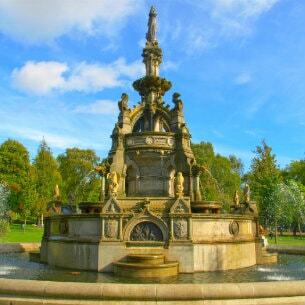 The park is famous for the Glasgow Fair and its very own landmarks such as the Collins Fountain, Doulton Fountain, High Court of the Justiciary, McLellan Arch, Nelson's Monument, People's Palace and Winter Gardens and the Templeton's Carpet Factory. The house designed by the celebrated Scottish architect Charles Rennie Mackintosh. The house has state of the art furniture and facilities that also include a cafe and shop perfect for people who wish to bond or talk, corporate events and weddings. The fascinating Victorian cemetery located east of the city's St. Mungo's Cathedral. The site is well known for its thousands of magnificent grave monuments and ornate mausoleums which made it one of Europe's most important and sought after graveyards. No words can describe the beauty that belongs to this graveyard. Find the city's collection of bohemian cafés, chic hotels, high-end boutiques, bars, clubs, parks, gardens and restaurants that serve great tasting foods here. This place is indeed a fun area to go to. The said part of the city is home to the Kelvingrove Art Gallery and Museum, Hunterian Museum and Art Gallery, Museum of Transport, Kelvingrove Park, One Devonshire Gardens, Scottish Exhibition and Conference Centre, the University of Glasgow, the Glasgow Botanic Gardens and so much more. Shopping Destinations like the Argyle Street, Buchanan Street and Saunchiehall Street are the city of Glasgow's prime shopping areas. The said streets homes high-end designer labels, unique items and department stores perfect for every fashionistas and or shopaholics. Feedback: I Never use any other website!!! Alamo Glasgow City Centre - Enterprise Rent A Car 40 Oswald Street, Glasgow, SCT. Avis Glasgow Downtown - 70 Lancefield St, Glasgow, . Budget Bd Budget Glasgow - 70 Lancefield Street, Glasgow, . Europcar Glasgow Central - 76 Lancefield Quay, Finneston, Glasgow, . Europcar Glasgow South Prestige - 76 Lancefield Quay, Finnieston, Glasgow, . Europcar Glasgow Long Distance D And C - 76 Lancefield Quay, Finneston, Glasgow, . Enterprise Glasgow City Centre - 40 Oswald Street , Glasgow, SCT. Enterprise Springburn - 31-41 Mollinsburn Street , Glasgow, SCT. Enterprise Rutherglen - 110 Glasgow Road , Glasgow, SCT. Green Motion Glasgow Downtown - 69 Buchanan St, Glasgow G1 3HL, UK, Glasgow, SCT.